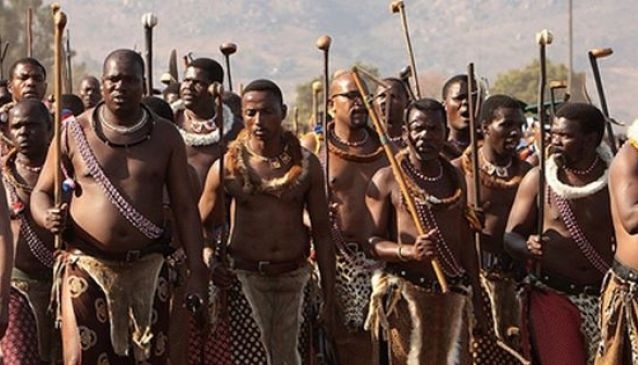 The Ngoni of Eastern Province trace their origins from the Zulu nation, a proud people with a warrior tradition. The Nc'wala was deemed to be too warlike by the colonial administration and banned. It was only in 1980 that the Paramount Chief Mpenzeni III revived the ceremony. The day before the ceremony, the Paramount Chief Ngwenyama Inkhosi Yamakhosi Mpezeni IV travels from his palace in a slow convoy of warriors to the Mtenguleni where the ceremony is held. Singing crowds line the route to welcome their Chief. The Inkhosi Yama Khosi, ruler of the rulers, and selected heardsmen take the first crops of the season to the Paramount Chief for his blessing. The Mulumo, the process of tasting the food, is a solemn occasion as the chief becomes the medium of communication between the royal ancestors and the tribespeople. This is followed by rousing dances performed by Ngoni Impis clad in skins and brandishing knobkieries, the Khuzeyeni, mainly women, clap and ululate. The climax of the ceremony is the ritual slaughter of a black bull, the Mnikelo, the Chief then drinks the blood of the bull. Visitors are welcome to take part and enjoy this traditional celebration.